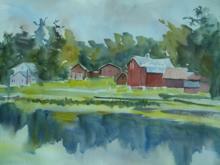 Hudson Valley Watercolor Artist: Karen F. Rhodes, Ph.D.
Karen loves the transparency of the watercolor medium. She enjoys the textural effects and surprises that the relative amount of water and pigment can create. Her paintings capture the deep appreciation she has for light and shadow. She considers herself an impressionist and conveys an emotional response to the subject through her use of color. Karen splits her time between Palenville and Suffern, both in the Hudson Valley. She draws deep inspiration from her hikes in the Catskills and the historic sites and buildings in the area. She also loves gardening and enjoys painting the flowers from her gardens and meadow. Her paintings have been exhibited in juried shows throughout Greene, Ulster, Rockland and Bergen counties. 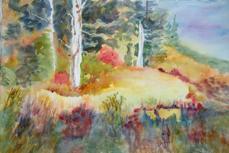 She is a member of the Windham Arts Alliance, GCCA and a juried member of ACWA. She is also a practicing psychologist. You can see more of her watercolors on FASO.com and Catskillcolors.com and Hudson Valley Watercolor Artist on Facebook. Contact her at Karenfrhodes@gmail.com or in Palenville, NY at 518-678-2290. Deep Shade Fall WC Karen F Rhodes 15x22.